What was your Wednesday Like? Jesus' Wednesday (during Holy Week) was a sad, brutal day that held a deep dark secret. One of His closest friends, one of the disciples, turned his back on Jesus and sold Him out to the chief priests. This was a pre-meditated act. He had witnessed a woman who was willing to use an expensive bottle of perfume on Jesus. In Judas' mind it was a complete waste of money. It had cost about a year's worth of salary to purchase it and he watched her pour out the entire bottle in one washing. To her it was a beautiful, sacrificial gift to the One who had transformed her life. To Judas it was irresponsible and he had finally had it–he went to the ones he knew understood value. 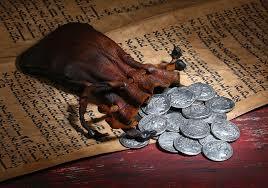 In turn, they gave him 30 pieces of silver–about a 3 month salary. Do you know betrayal like this? Have you ever been betrayed by a close friend or family member? If so, Jesus says to you, "I know how you feel." If so, Jesus says, "I know what you are going through." If so, Jesus says, "I understand." • The disciples falling asleep in the garden when Jesus needed them most. • Judas betraying Him with a kiss for some cash. • The Disciples ran for their lives as Jesus went through the roughest, unfair, illegal trials. • Another close friend, Peter, denied knowing Him 3 times. Then, on the cross... "My God, My God, why have you forsaken me?!" Jesus knows betrayal, loneliness, horror, back-stabbing. Why did He go through all of this and more? Let's worship Him, Let's tell others about Him. Let's invite others to Good Friday and Easter services. Let's do what ever we can to join all of Heaven in proclaiming His name. Ps 41:9 Even my close friend, someone I trusted, one who shared my bread, has turned against me. As the greatest day in the history of the world is coming, EASTER, are you ready to celebrate?!?! Are you ready to spend time with Jesus thanking, worshiping and listening to Him? Are you ready to hear His mission for you this Easter season? Or are you too busy and might it slip right on past you? Quite often people share with me how they miss out on special things God has for them. Quite often the two holiday seasons, Christmas and Easter, get so cluttered with less important details that we miss out on what God has for us. This Easter season, what are you going to do to make sure you do not miss out on what Jesus has in mind for you, your family, and your church? What "risky prayers" are you going to pray? When are you going to listen to Jesus? Let's read a few verses that start the Easter week for Jesus. How did Jesus clearly declare that He is the Messiah in the following verses? Conversations are give and take. Conversations are back and forth. Conversations are always two way. When conversations become one way, it becomes a monologue. Who likes to listen to a monologue? As we have been focusing on Risky Prayers for the past three months, have you discovered and grown in your two way conversation with God? Or are you monologuing to God? Have you taken the daily time to be still and listen to God? If so, what is He saying? 1. Of course, God speaks clearly and practically through the Bible. Every time we read God's Word, He is speaking to us; sometimes generally (2 Tim 3:16) and other times very specifically (Heb 4:12). The question becomes, are you letting God's Word speak to you? It is always easier to read the Bible when trying to finish a Bible study with your Sunday School class or small group. Or when you are seeking wisdom for some other person. But, do you turn the Bible to your heart, to your soul to have it speak directly to you? What are you hearing God say to you? 2. God also speaks through Biblical teachers. This is the Biblical pattern. God gives a message to His spokesperson and then they go and share the message. Have you ever been at church or a conference and the speaker or pastor seems to be just talking with you? Does it seem like God is saying something through them to you? Or are you seeking to tune out God's voice through specific teachers for some reason or reasons? Are you humble enough to ask God to speak to you through Biblical teachers? 3. God speaks through circumstances. Jesus trained His disciples to hear God speak through circumstances in Matt 10:11-14. God's direction will be revealed by how others responded to them. As we walk with Jesus, He has to constantly make course corrections and one way He does that is through our circumstances. It helps to be debriefing about circumstances with close brothers and sisters in Christ. 4. God speaks through impressions or ideas. Amos 4:13 "For the LORD is the one who shaped the mountains, stirs up the winds, and reveals His thoughts to mankind." This is always very challenging because there are two extremes. One is that God is speaking clear ideas to people all the time. The other is that God does not speak this way at all. One thing is for sure, God will never say anything that is contrary to the Scriptures. If it is not Biblical, it is not from God. "Will you confess ______ yet?" "Will you let Me transform ______ yet?" "Will you accept My mission today yet?" Hello? God, Do You Hear Me? What is one of the most frustrating things about following Jesus? Is one of them, "Do you really care about my prayers?" "Why are you not answering my prayers?" "I have been praying and it seems like you are not listening, why? Are you too busy? I know other things and other people are important but this is important too!" Was Jesus exaggerating when He said, "Ask and it will be given to you; seek and you will find; knock and the door will be opened to you. For everyone who asks receives; the one who seeks finds; and to the one who knocks, the door will be opened." (Matt 7:7) Or was Jesus saying every prayer prayed is answered? Regularly we need reminders on how God answers every prayer. 1. Sometimes, God answers our prayer with a "No." This is always the most difficult answer that we do not want. We want a "Yes." But, when we stop and remember that when Jesus asked His Heavenly Father to remove the cup of going to the cross, aren't we all glad God said "No" to Jesus? If God answered Jesus' prayer with a "No," then we need to hear God say to us, "No." Just like Garth Brooks' famous song, Thank God For Unanswered Prayers. Brooks' theology is a little off by the title but the heart of his lyrics are right on. The title should be, Thank God for His "No's." 2. Sometimes, God says, "Wait." Why does He respond with a "wait?" He is more concerned about our lives, our character and our relationship with Him than our prayer request of help "I'm sick." "I'm in a financial challenge." "I'm in a relational battle." "I'm ..."
He is also working on all parties involved in the situation. This is mind boggling to say the least. But, let's remember, Rom 8:28 We know that in all things God works for the good of those who love Him, who have been called according to His purpose. 3. Sometimes, God says, "Change." James 4:1-3 What causes fights and quarrels among you? Don’t they come from your desires that battle within you? You desire but do not have, so you kill. You covet but you cannot get what you want, so you quarrel and fight. You do not have because you do not ask God. When you ask, you do not receive, because you ask with wrong motives, that you may spend what you get on your pleasures. Here God reminds us that our motives matter. Our alignment with Jesus and His will matters. The changing of our minds, our character, our plans to fit in and join Jesus' plans matter. As we pray, maybe Jesus is asking, "When are you going to join Me?" "When are you going to care about the things that I care about?" "When are you going to say, 'Not my will, but Your will be done?" 4. Sometimes, God says, "You Betcha!" We love these responses from God. I love and am haunted by Acts 12. There is the first heartbreaking martyr and this miraculous rescue. Acts 12:2 James was put to death by the sword. Peter was arrested and put into prison. v 5 So, the church was earnestly praying to God for him. v 16 Peter kept on knocking, and when they opened the door and saw him, they were astonished. God loved to say "Yes" to the entire churches' prayer to rescue Peter. God loves to say "Yes" to our prayers as well. When has God said "Yes" to you lately? Do you have a list? How have you thanked Him? How have you let others know about God's personal "Yes?" 1. Communicate the Financial Challenge. 3. Create and live on a Spending Less Plan. 4. Seek to get back on our agreed upon Giving Budget. Let's continue to pray. Let's continue to see how God is answering our prayers. Have you ever thought to call the entire world to worship God? What if God asked you to call the world to worship Him? The Psalmist who wrote Psalm 100 seems to have had that assignment. Look at who he is encouraging to "shout for joy to the Lord... all the earth." Let's look at three descriptions this Psalmist used to worship God and describe God. Ps 100 Shout for joy to the Lord, all the earth. Worship the Lord with gladness; come before Him with joyful songs. Know that the Lord is God. It is He who made us, and we are His; we are His people, the sheep of His pasture. Enter His gates with thanksgiving and His courts with praise; give thanks to Him and praise His name. For the Lord is good and His love endures forever; His faithfulness continues through all generations. 1. "The Lord is good." v 5. In verse 3 we see the Psalmist declare the position and role of the Lord, "The Lord is God." The Lord is the One and Only Creator who oversees all of His creation. This Creator, Involved God is "good." This describes His character. The Hebrew word for "good" is "towb" which means "pleasant, agreeable, bountiful, delightful and good." Do people in our neighborhood and work places see God like this? Or do they seem Him as angry, stomping around heaven looking for someone to unleash His wrath? No, God is "pleasant, agreeable, bountiful, delightful and good." Our world needs to hear and experience Him. 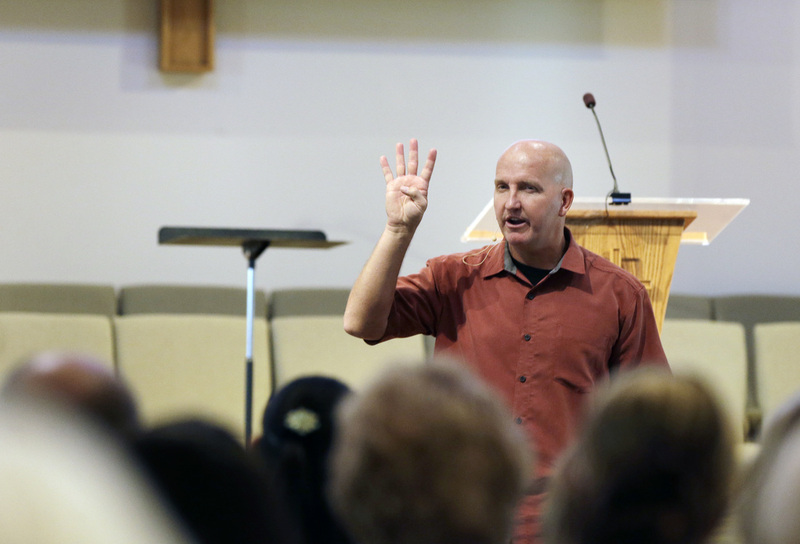 We at Southtown need to embrace that the Lord is good and is taking care of our personal needs and our church needs. "Chesed" is the Hebrew word. There is no English word that we can use to describe this characteristic of God. Chesed is one of the most important Hebrew words in the entire Old Testament because it seeks to sum up the entire character of God. Think about Ruth's other-worldly love she had for her mother-in-law... chesed. Think about Jonathan's other-worldly devotion to David, willing to give up his birthright to be King... chesed. Think about God's instructions to Hosea to love and marry a prostitute... chesed. Think about God's overwhelming patience, love, care, power for David even in David's lust, abuse of power, lust, murder and even more lust... chesed. Think about God becoming human in the person of Jesus Christ... chesed. God knows all of who we are and what we have done (anyone knowing this, would reject and run from us) yet God shows us His other worldly kindness. A love that we do not deserve. A love that is more beautiful, satisfying and life altering. His love never runs out. We need to daily experience this from Jesus. Our world desperately needs a taste of this, of Him. Are you going to be like the Psalmist tell them? God does not show favoritism. He loves each person, each family, each generation as if there was no one else on the planet. Are you experiencing His faithfulness to you personally? Are you experiencing His faithfulness to your family personally, your church family personally? I know He is faithful to Southtown and is walking through our financial challenge with us right now. Our world does not know about loyalty, faithfulness, keeping our word or promises. Oh how the world would change if they knew this amazing faithful God. Who is going to show them? Who is going to help them experience this Psalm 100 God? It is the mission of the church to do this. What challenges is your family facing? What challenges are at your work? What challenges are at your church? The Psalmist wrote Ps 46 describing real life problems that he and his community were facing with some very descriptive words and phrases. Grab your Bible and read Ps 46. "Earth giving way." "Mountains falling into the sea." "Waters roaring and foaming." "Mountains quaking." "Nations in an uproar." "Kingdoms fall." "The earth melts." These words clearly describe overwhelming problems, causing fear to gush through everyone's veins. "The Lord Almighty... our fortress." Take a moment right now and live these Biblical instructions out. Take a moment every day or a few times throughout the day and live out these Biblical instructions. Can you see how Martin Luther could not help write one of the most famous hymns based on this Psalm? Psalm 46 God is our refuge and strength, an ever-present help in trouble. 2 Therefore we will not fear, though the earth give way and the mountains fall into the heart of the sea, 3 though its waters roar and foam and the mountains quake with their surging. At Southtown, we are facing a few family challenges. We are in need of a Custodian. Until we hire someone, we need everyone's help to keeping our building looking great. We are also facing a Financial Challenge. We need God to work through each of us as we give joyfully and generously. For God loves to bless individuals, families and church families. This Sunday we are going to pray the Risky Prayer, "Hey Dad, We Need Your Generosity." God is our Fortress, Strength and Warrior. Life is like a rafting ride down a river - full of adventure and challenge. Some days the ride of life is sunny as we casually float down the river. Other days the ride of life can be overcast, rainy with massive rapids causing us to grip onto the raft with all we have. Some days are filled with both. Those are unique days. Most days are something in between these two extreme experiences. These days can also be seasons. The gift Jesus provides is to offer to be the captain of our raft. If we accept, He will ride with us through the different adventurous river days. What is the current river conditions in your life these days? Sunny, smooth, rainy, light rapids or heavy rapids? What do you do when you are facing heavy rapids? Psalm 100 is known as the "Psalm of Praise." It reminds us who God is. It reminds us who we are. It reminds us what God loves to do with us no matter the smooth waters or heavy rapids that we are facing. Read it. Let God speak to you through it. Ps 100 "Shout for joy to the Lord, all the earth. Worship the Lord with gladness; come before Him with joyful songs. Know that the Lord is God. It is He who made us, and we are His; we are His people, the sheep of His pasture. Enter His gates with thanksgiving and His courts with praise; give thanks to Him and praise His name. For the Lord is good and His love endures forever; His faithfulness continues through all generations." Through all generations, through all our lives as we have walked with Christ, we have historical experiences of God's goodness, of God's enduring love, of God's faithfulness. Take time to remember some of these past experiences. Share a few of them with your spouse, family and friends. Encourage each other with these historical experiences with Jesus. As you face rapids of life, remember who God is, who you are and what He wants to do in your life. As a church, we are facing a financial challenge right now. As we begin to communicate this with you, let's go to God in prayer, let's understand our financial challenge, let's see what we can do to save money and to be generous. Let's remember God is good. His love endures. He is faithful. Jesus' disciples were amazed at how God answered Jesus' prayers. So much so that they asked Jesus how to pray. Even after training them how to pray, they always seemed to doubt that God would do anything through them like God did through Jesus. Do you ever feel like that? Do you ever feel like God answers other peoples' prayers and not yours? As we are in this prayer series to start 2019 and as we are memorizing Eph 3:14-19, how is your prayer life? Do you find yourself praying more or less? Are you risking and asking for more or less? Are you letting God speak to you personally even if you do not like what you hear more or less? Has God amazed you with His answers to your prayers? "Being rooted" means "to strengthen with roots." It is the idea that daily our roots would continue to grow and deepen in what matters most, experiencing the love of God. "Established" means "to lay a foundation"
It paints the picture of one of the most important steps of building, laying a sure foundation. When I worked as a carpenter through college, before we laid the foundation of a new home, we would have to clear the lot of trees, bushes, weeds and grass. We would pull out chainsaws and cut down massive trees. Then we would hire an excavation company to dig up the ground. Then we would create the foundation forms that would hold the cement that was poured in them. Without this solid foundation, the house would be at risk when hit with strong winds, severe storms and unpredictable tornadoes. How much more do our lives need the sure foundation of Christ's love but also a growing, living, strengthening root of Christ's love? "Would have power... to grasp how wide and long and high and deep is the love of Christ, and to know this love that surpasses knowledge." Why do we need to be empowered to experience this multi-dimensional love of Christ? Think about human relationships for a moment, isn't it hard to grasp, understand and experience love sometimes? Don't we question whether another person really loves us or not? How much more difficult is it to grasp, understand and experience love from the invisible Jesus Christ? How do we experience this with Jesus whom we cannot see, touch, or be hugged by Him? This prayer to experience Jesus' love is about receiving power to experience His love. Power to create and hold the foundation strong. Power of The Builder to create this foundation in us. Power to keep growing the roots in our hearts, minds and soul. Power of The Son to daily grow these roots deeper. It's the Power of God to continue to help us experience Jesus' multi-dimensional love. Think about the differences among one dimensional, two dimensional, three dimensional and four dimensional... 2D (TV screen) to 3D (real person) to 4D (including invisible spiritual reality). "How wide" - this paints the picture of how wide is the door of Jesus' love. Who is welcome and loved by Jesus... EVERYBODY! "How long" - this paints the picture of distance. Is there anyone too far gone, too far away from God for Jesus to love, NO! "How high" - What does this mean? "How deep" - What does this mean? Please email me back your thoughts as we learn to pray these prayers together. By the way, this verse was part of my vows to my wife 26 years ago.